This lift features an innovative 6-point cradle that works with an array of Hoyer slings, including 2, 4, and 6-point slings, an extended reach for floor pick-up capabilities, and a C-Base. Its long-wearing chrome finish maintains appearance and the mast and base separate for easy travel or storage. 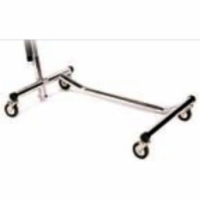 Standard 4" casters are offset for greater stability and smooth operation.